We can argue forever about which is the oldest pack of foxhounds, but the evidence for the Burton being one of them is incontestably presented in a map of “Parte of Lincolnshire showing the boundaries of hunting ye Foxe with our hounds in this year of Grace 1672, John Monson, Burton Magna“. These were not the days of equestrian cut and thrust. The cold dawn would have seen the Monson family and a few friends in their heavy clothes, on unclipped horses, with slow hounds nosing the drag from some nocturnal fox across the wild heath north and south of Lincoln. The Monson family stuck to their pastime through 150 years. The sport grew faster. Mother Monson complained that her son spent too much time hunting. Son Monson enlarged the hall for the hunt breakfasts and the Sub-Dean of the Cathedral, tried beyond his patience by the endless dinner chat of hunting, let off: “You are a parcel of men with vacant minds; The dogs smell a stink, they run and you gallop after them“. Lord Monson engaged a second whipper-in, and a correspondent (1782) wishes him “plenty of foxes and good scenting days, no lame horses and the devil take the hindermost“. Just when, in 1809, the 24 year old fourth Lord Monson was warming to the task of keeping his pack of foxhounds amongst the best blood in the country, nature accounted for him. The gentlemen of Lincolnshire cast around for a new master and up turned one of those adventurous amateurs whose exploits with hounds and the ladies either break or make a hunt. George Osbaldeston was 25 and he soon fell out with everyone except the foxes which he pursued with great noise, energy, boastfulness, courage and determination, to the far corners of the country. The reputation of the Burton was confirmed. The next 70 years were to be a golden period of six days a week, money no object, good scenting and grass hunting. Thomas Asherton-Smith, the best and most fearless horseman of his time, gave up the Quorn to join them for the sober flute-playing family man, Sir Richard Sutton, spent £300,000 on them; bachelor, introverted, sometimes even dirty Lord Henry Bentinck, daily rode three galloping hacks the 50 miles from the glories of Welbeck to hunt them and bred a pack of foxhounds whose blood lines would be sought after for the next half-century. The last of this breed was Henry Chaplin, son of a country parson. His company sought by the Prince of Wales, his fiancée stolen by Lord Hastings and nicknamed “manifico”. When money ran short he backed his horse, Hermit, to win £170,000 in the Derby and it did. After four years, money was again short and in 1871 Chaplin hived off to the southern half of the county and formed the Blankney. After 1871 the hunt went through 55 years of sound management with many good hunts first under F J S Foljambe and then Thomas Wilson. 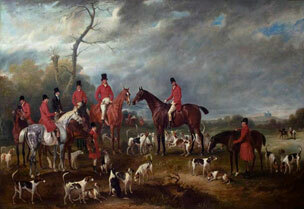 Foljambe’s huntsman was the famous Will Dale, who later went on to Brocklesby and Badminton. The gloom of the depression was relieved for the Burton farmers by Sir Julian Cahn, renowned in the cricket field by the size of his pads which were said to be inflated by a bicycle pump, respected in the hunting field by his kindness and generosity to the farmers. He removed wire, gave prizes for the best kept hedges and bought and rented coverts. They got through the last war somehow. The subsequent revival of the hunt has in no small measure been due to Bill Lockwood, his son A W Lockwood and now his grandson John Lockwood. The Dynasty has now reigned for 70 years and shows no sign of losing impetus!